Schnitzel is made of meat — usually chicken, veal, beef, turkey, pork — even mutton and reindeer. A schnitzel really refers to the preparation of the meat dish — pounding thin with a meat tenderizer, then dipping in some type of breading and frying to a crisp golden exterior. Wiener Schnitzel is a proprietary name (from Germany and Austria) and can only be made of veal, otherwise it must denote the type of meat being used… i.e. weiner schnitzel of pork/turkey/chicken. So you’ll obviously want to start by cutting the meat for these breaded pork cutlets into 1″ thick slices and pounding it out between two sheets of plastic wrap with your meat mallet. You don’t need to use the jagged edge side of the mallet for this recipe because pork tenderloin is very tender from the start — no need to further abuse it. Flour, egg and breadcrumbs are a traditional preparation for many schnitzel recipes, but this one takes a slight jog away from the classic breaded pork cutlets with this tangy savory blend. Try canola oil or grapeseed oil for frying and make sure you fill your pan to have between 1/8″ to 1/4″ of oil in the bottom. This is a shallow pan fry, but it does the job to get the exterior really crunchy while cooking the meat to doneness. Use a heavy skillet to fry up these breaded pork cutlets (cast iron is always preferred). A pair of tongs is helpful for turning the breaded pork cutlets — I prefer them to a fork, because a fork stabs the meat and creates openings for the oil to get between the breading and flesh, risking that a chunk of that golden coating could float off into the pan — don’t risk it for your schnitzel recipes. So the burning question of what to serve with pork schnitzel can be as simple or gussied up as you want to make it. Here are some common go-withs and links to their recipes (if needed). Schnitzel literally means "cutlet" and for this crunchy schnitzel recipe, I've used pork tenderloin for super tender results with a quick cooking time. A great fall or winter meal especially with braised cabbage and mashed potatoes. Align three shallow bowls or dishes. In the first bowl, combine the flour, salt, pepper and onion powder, mix to combine and set aside. In the second bowl combine the mustard and milk. Whisk to combine and set aside. In the third bowl combine the panko breadcrumbs and parsley. Set aside. 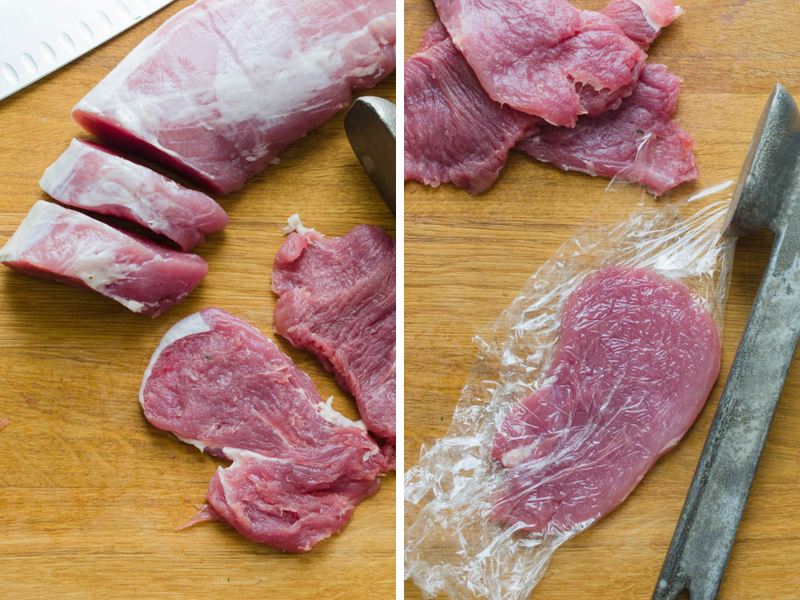 Trim the pork tenderloin of any silver skin or fat. Slice the pork crosswise into 1" thick slices. Cut a piece of plastic wrap about 12" square and place a piece of pork on the plastic. Fold half of the plastic wrap over the pork and use the flat side of a meat mallet to pound the pork into 1/4" thick cutlet. Continue with the remaining slices of pork tenderloin. Dip the pork into the flour mixture to coat and shake off any excess. Transfer the pork to the mustard mixture and use a pastry brush to lightly coat the floured pork. Add the pork cutlets carefully into the pan (don't drop them, they will spatter the hot oil) in a single layer (you'll probably need to work in batches). Fry the pork cutlets on one side for 3-4 minutes or until medium brown/golden brown color, then use a pair of tongs to flip them and continue frying an additional 3-4 minutes until done. Transfer the fried cutlets to a sheet pan lined with paper towels. Continue with the rest of the pork cutlets. Arrange the pork on a platter and sprinkle with parsley if desired. Serve with braised cabbage and mashed potatoes. Pin “Crunchy Breaded Pork Cutlets” For Later! Cutlets are so good, don’t you think? This sounds so easy and flavorful! The perfect family meal for busy weeknights or would even be a lovely date night dinner. It’s been a while since we had date night! This pork cutlet recipe looks so delicious! Lovely photos! My goodness this looks good! I can almost taste it through the photos! My kind of meal! Mmmm, I love pork cutlets, your flavours in the bread crumbs sound so delicious! It’s really the dijon mustard that kicks it up! This looks like it would be an instant family favorite meal! I can’t wait to try it!